Instant payments and cashless payment services are becoming increasingly popular as South Africans begin to shy away from carrying cash on them for safety and convenience reasons. Enabling this type of purchase behaviour has been the introduction of the Smartphone in the technological age. The Smartphone has become more than just a personal communication device and continues to offer new opportunities for convenience. Banking in South Africa has taken to the mobile ecosystem and begun to add various mobile payment options to give customers more freedom when making payments. It is with this mobile evolution of accessibility that many business and institutions are continually improving their services. As mobile continues to be a focal point for South African banks development continues to thrive. In the latest announcement, FNB has introduced another option to their services known as QR payments. So what does this mean for local banking? Well, before we look at what this launch means, let’s understand QR payments. QR codes aka Quick Response code are two-dimensional barcodes. They consist of a pattern of black squares arranged in a square grid on a white background. QR codes can be read with an imaging device such as a smartphone camera. This pattern of software was first introduced to us through BBM codes and WhatsApp. QR code payments allow merchants to receive payments from customers by scanning generated QR codes using a smartphone camera. A QR code is generated and the customer pays by scanning it with his phone to transfer funds. The QR code payments carry the purchase transaction information to the mobile device of the buyer/customer, and a confirmation of payment SMS for the seller. Are QR code payments safe? QR code payments speed up the e-commerce payment experience, making it secure and safe. All a customer has to do is scan. Traditionally, the mobile money process involves sending money to a merchant code or phone number. However, QR code payments reverse this process and allow a merchant to set his price and all the consumer has to do is scan to complete the payment. Are QR code payments convenient? This method of payment is convenient because it is quite adaptable as it can be used by restaurants, fuel stations, supermarkets, market trader, etc. This payment option is equipped to handle high traffic payment points where speed is of the essence while the merchant wants to be in control of the payment amount. QR code payments allow businesses to accept mobile payments without the need to invest in a point of sale terminal or any other hardware. Additionally, companies don’t have to worry about what device the customer is using, as any smartphone can read a QR code. What does this launch mean for FNB? Instant payments have had considerable success in the South African market with QR payments apps such as Zapper and Standard Bank’s Snapscan being front runners with the technology. FNB knew that they couldn't be left behind but needed to launch their QR payment differently in order to capture customers attention. 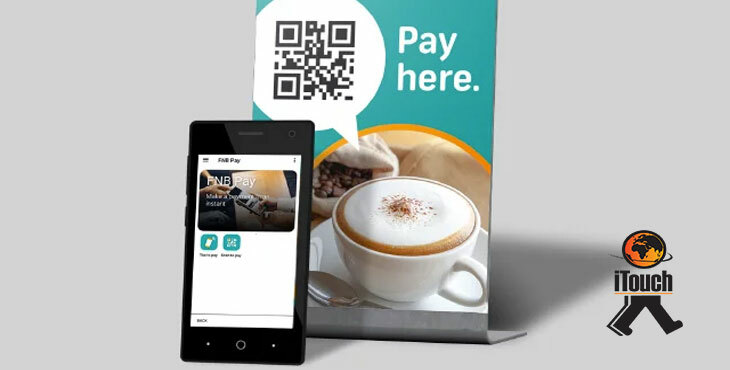 FNB have become the first bank in South Africa to expand its digital payments ecosystem and integrate QR code payments into a banking app for both consumers and sole proprietor businesses. Which sets them apart from the standalone QR apps. This means that QR code payments can be done on the FNB Banking App which gives customers another option in terms of digital payments without having to download any additional app. “We are rapidly expanding our digital payments ecosystem by providing customers with helpful digital payments solutions. Equally, businesses will select Payments, login and click on ‘Speedpoint’, register and begin to utilise the service within 24 hours. Businesses have the option to display the QR Code within the FNB app, email and print the QR code, or share it via social media. This innovative capability is powered by Masterpass and Mastercard’s digital payment service, which is interoperable with most major domestic scan-to-pay services, representing a footprint of approximately 140,000 merchants and billers. There are no monthly rental or maintenance costs which makes this a cost-effective means for a business to accept digital payments. Those businesses that do not bank with FNB can open an account, register and start accepting QR code payments all within the FNB App. Adding this type of convenience will only increase the frequency of use for FNB's banking app and make instant digital payments more popular as South African's continue to move towards a cashless approach to payments.